What began as doodling as a child for Ray Gatica, a Humble. resident, has evolved into an art career that is known from Dickinson to Austin. Gatica mostly does murals in mediums ranging from airbrush to acrylics. Some of his work can be seen in Katy ISD schools as gym wall graphics, Rainforest Cafe in Katy Mills Mall and Bally Total Fitness Center's nursery at 19304 Highway 59 in Humble. Private referrals also keep Gatica busy. Crystal Pickens, a Porter resident, had Gatica paint murals in two bedrooms in the home. '• "I love all of it. He does such an excellent job. One is a fishing scenery, and the other has graphic lightning in it. We had found pictures off the Internet of what we wanted. My sons love it. It's just great, and he was great to work with," said Pickens. Brandi Dunn, a New Caney resident, was referred, like Pickens, to use Gatica's services. Gatica's outer space scene in the Dunn's game room has captivated the family. 'It's great. It's very creative. We really like it. I would definitely recommend him to someone else," Dunn said. about the things I've done. It gives me the most joy." • Gatica, a Sinton, Texas native, grew up as the fourth of 10 children to Reyes and Roman Gatica in Phoenix, Ariz.
' While growing up, Gatica discovered his love for drawing and began illustrating comic strip characters and life drawings. In 1975, Gatica attended Glendale Community College in Glendale, Ariz., and studied art, graphic design and life drawing. By 1982, a move to Waterbury. Conn., led Gatica to freelance illustration work where he refined his air brush techniques and worked in primary mediums. Humble became his home in 1992 and his career as a commercial artist came to life. "I've been in art so long I've done a lot of different things from portrait life size acrylics to murals to billboard touch-up work," said Gatica. "I liked doing art deco work when I was younger. It had a hint of realism and impressionism." One of his latest works is a 5-by-6-foot canvas at Italiano's at 217 FM 1960 Bypass E. in Humble. finish technique to simulate stonewalls, coral and flowers. His average project can take anywhere from 30 to 40 hours to complete when, working out of his garage home studio. Watching a viewer's reaction to one of his completed works is Gatica's favorite thing to do. "It's the most joy for me when I see people get excite about the things I've done,' Gatica said. In his free time, Gatica enjoys spending time with his wife, Millie, who works in accounting, and creating airbrush art on metal and other projects. To view his work, go to www.Murals and BigArt.com and www.GaticaArt.com. 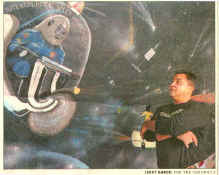 Above OUT OF THIS WORLD: Ray Gatica, an artist from Humble who mostly does murals in mediums ranging from air brush to acrylics, shows off his completed outer space-themed mural in a home that is still under construction.